It's been two long years since work began on Trabzon's western coast. The city stuck between the Black Sea and high mountains saw an immense project increase its surface, by covering 795,000 sqm of water with land. This place is to become the agglomeration's largest sports/commercial complex. At its heart the main stadium for 41,000-42,000 people is planned, accompanied by five training pitches to the east and extensive office/commercial complex to the west. Along the coastline new municipal beaches and a marina are to be created. The stadium itself is to cost a rather modest TRY 230 million (€85m / $115m). Its design sparked controversy back in 2011, because the architectural form is an exact copy of the same company's previous work. German ASP Architekten from Stuttgart first bid with their concept for the new FSV Mainz stadium, but as they weren't selected, they repeated the attempt in Turkey. Despite that controversy the design was retained as preferred by authorities and is without a doubt interesting and fits in the Akyazi complex just as well as it would in the outskirts of Mainz. Double-tiered stands with extensive corporate part in the west are to be covered with very light, translucent membrane spanning over steel frames. The frame creates a catchy geometric outer form that may easily be illuminated at night. On Sunday construction formally began, though in practice piling work to give the stadium stability has been under way for many weeks. From now on it should take two years, which means the stadium is to be delivered in late 2015. 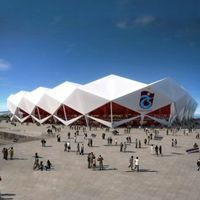 The ceremonial groundbreaking was attended by a few thousand people, who were treated to speeches by officials, including prime minister Recep Tayyip Erdogan. Though officially a declared fan of his mother-district club Kasimpasa, Erdogan had no problem with wearing a Trabzonspor scarf on the day and mounting the cornerstone himself.